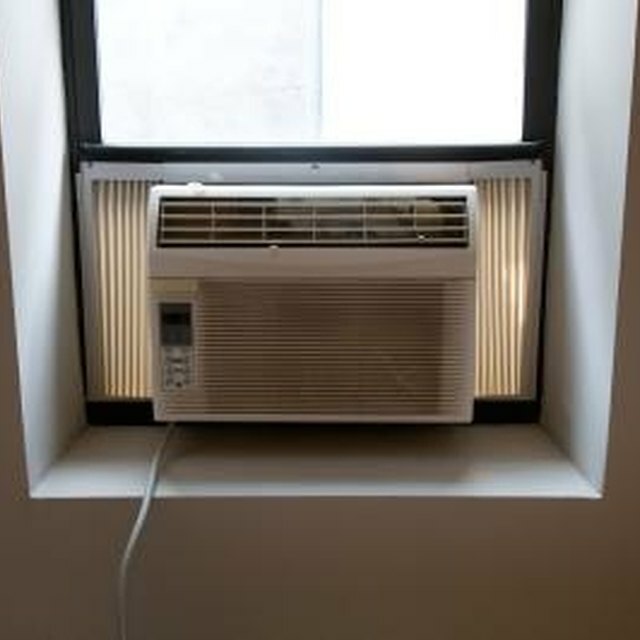 Air conditioning systems include a condensing unit. These units are the main part of the air conditioning system and are placed outside of the home or business. The condenser should match with the rest of the air conditioning system, so check the manufacturer's recommendation before you install a condensing unit onto your air conditioning system. Condensing units can be installed either on the ground or the roof of a building, as long as the surface is stable enough to support the weight of the condenser. Air conditioning condenser units are located outside the home. Evaluate the surface you will install the condenser. The surface must be strong enough to support the condenser. Most condenser pads are made of concrete or plastic. Check the area for any obstructions to the intake of the condenser unit. If multiple units are in use, the exhaust of one unit should not point in the direction of the intake of another unit. Check that the unit can be accessible for repairs and maintenance. There should be plenty of room around the condenser unit to allow a workman to work on the unit. Carefully lift the condenser unit into place. These units are heavy, so have at least one other person help you lift it onto the condenser pad. Secure the condenser unit to the pad or roof using steel framing, and level it. Check all the electrical connections, nuts and bolts on the condenser to ensure they did not vibrate loose during shipment. Check that your refrigerant pipe line is the same size as the piping on the condenser unit. Connect the piping to the condenser unit, then to the receiver. Solder these connections to prevent leakage. Apply insulation to all the exposed refrigerant piping, leaving the connections un-insulated. Pressurize the system with nitrogen and check for leaks by applying soapy water to the connections. Wire the condenser unit according to the manufacturer's wiring diagram provided with the unit. Charge the system with the type of refrigerant recommended by the manufacturer. Begin charging the unit from the high point in the refrigerant system, to break the vacuum within the piping. Connect the refrigerant gauges and amperage meter. Turn the condenser unit on and see that all parts work correctly.